TIME For Kids is committed to helping teachers meet Common Core State Standards, National Curriculum Standards for Social Studies and National Science Education Standards. Click here to learn more about TIME For Kids and national learning standards. Regardless of what the Science/Social NATIONAL standards are, Time for Kids will support them and are committed to help teachers meet those standards via Time for Kids common core aligned curriculum. A private company doesn't really know what these standards are, but gee golly, Time for Kids will be there to align the curriculum to meet those standards. See how this works? More time in school will be taken up in test taking (think "NCLB on Steroids"). "Hannah" thinks "it's good that kinds in many other states will take the same tests". Why do you think Time for Kids would portray being common as a good thing? Since welcoming/accepting the idea that students should learn from common standards is paramount for CCSS proponents, the students have a lesson from Time for Kids instilling that message. Yay! Common Core! Notice the math problem? The "old" way of answering is multiple choice which is dependent on the student knowing his/her math facts. The common core way is language dependent and has less to do with math facts than it does with explaining how you came to the answer. Remember, this is 3rd grade. 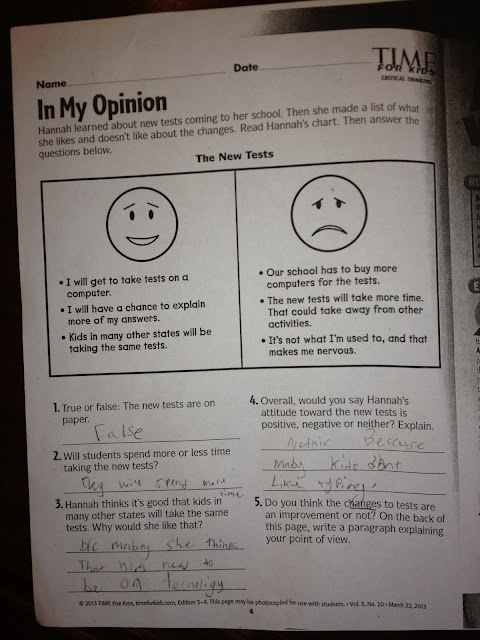 Note that this student prefers multiple choice because he/she can "think" about the possible answers. Keep those worksheets coming into Missouri Education Watchdog. Just a question: Does having the "Common Core Aligned" stamp on the cover gives these publishers, whose vision is social engineering, a pathway into the schools? Just who is writing the curriculum? Is Common Core the vehicle for not only data collection but also for political theories? The video saves the worst for last: tracking through the grades with rubrics to "measure growth and change in behaviors and attitudes". This makes clear the fundamentally different philosophies of education. Whereas traditionally education is the equipping of students with information and tools to learn in the various subjects, the newer model has no qualms about having character development as a central part of the education model. School supplanting parents. Those of us who work in the schools have no desire to be parents to our students. It's enough work just to be teachers. But in some districts, like the one I work in, many, many of the kids are coming to us with no one in their life that helps them with character development. Even if you believe that those kids should just have to live with the parents they chose, we teachers still can't ignore the lack of character development, because it lives in our hallways and classrooms and prevents us from doing our jobs. So we have to deal with it. Folks need to stop looking for the liberal boogeyman behind everything that goes on in public schools. Most educators are just ordinary people from all parts of the political/philosophical spectrum who are just problem-solving as we try to do this increasingly difficult job. First, helping students develop character should be an educator's choice, if the situation is highly dependent upon it. Second, why does Common Core Corporate Curricula need to develop lessons that do this? What else does CCSS need to get involved in? Constructivist lesson plans in Phys. Ed on how to dribble a ball? By the way, I wouldn't call them liberal boogeymen as nobody is being "liberated". Dave I respectfully disagree. Educators are not ordinary, but are professionals and EXPERTS in their field. If this is your profession, do what you do best... EDUCATE! Educate yourself on the entire history of common core and stand up for your future and career! Change is coming and education will NEVER look the same if teachers continue to march to the beat of the mechanical drum. If you could have made a difference in NCLB, would you have? Your voice is SO important. Please set the standards aside for one second and look at the foundation. Ask questions. It's OK if you do not fit in the pre-made peg hole. Pretend this is your business. Would you do business the same way? Is it OK for your children to practice the same behaviors our government has in implementing common core? Try to find one real life example where you could apply the same logic. ie: Would you sign a contract on a house, car, or education without knowing the details of that contract? None of it makes sense, nor would you apply the same practices to your own life. From what I have been able to see, this common core program is communist inspired. I will fight the introduction of common core as much as possible. I want it destroyed. Our education system is in the toilet and turning out idiots. We need to go back to the basics and get politics out of the school system. Dave, a few hours ago I attended my grandson's elementary school graduation. If a high percentage of students graduating from high school cannot read their diploma, I would say that not a single teacher performed their job. So you can call yourselves professionals, but I would say, most of you missed the boat. Remember, all teachers have been indoctrinated in the leftist colleges of education. You have been willing dupes for the "fundamental change" that has been evolving for many years. You job has been to radically change the attitudes, values and morals of our children. I must say, "job accompllished." Government has recognized the propaganda value of education since the time humans started forming tribes.. Along with teaching children how to hunt, and what was or wasn't safe to eat, children were taught why the other tribes were 'bad'. But never before in US history have we treated indoctrination as the purpose for education, instead of a sometimes useful side benefit. As a kid I was taught about countries that made indoctrination the central goal of education.. The most frequently used examples were the Soviet Union, Red China and Nazi Germany -- and we were taught the things that happened in those countries couldn't possibly happen here because our Constitution prevented it.. Isn't working out that way..
After reading all the fine replies, yours Lisa, cut through to the real core of the issue. 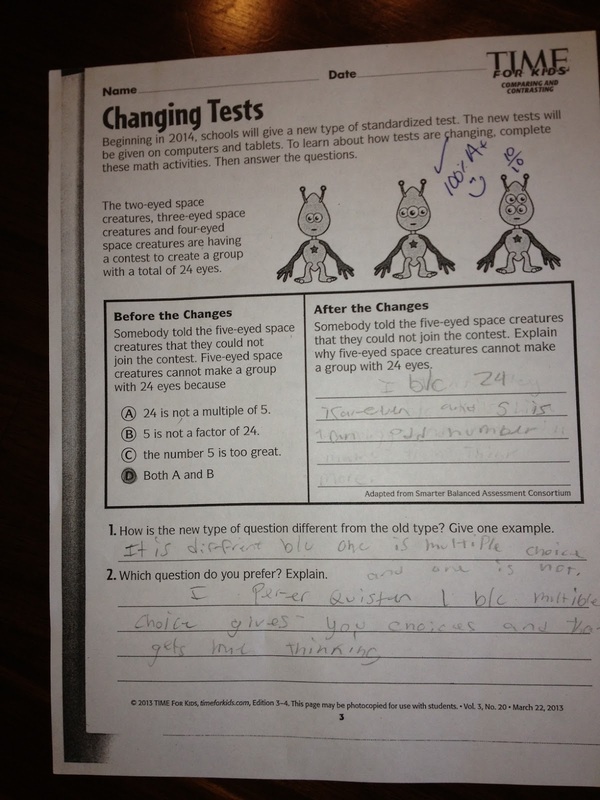 The two-eyed space creature worksheet is an exact sample item on the SBAC test!